Art Deco diamond hair combs by Black, Starr & Frost. You are here: Home / Jewelry / Tiaras and hair ornaments / Art Deco diamond hair combs by Black, Starr & Frost. Have I mentioned my love of hair bling recently? I am a serious hair bling enthusiast. You wear your hair every day, you might as well adorn it. Much of the most fabulous hair bling comes to us from the past. Remember the Cartier hair ornament I showed you a while ago, and my roundup of tiaras? Such beauty. 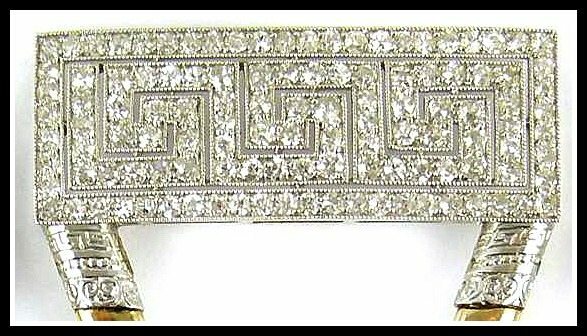 These Art Deco diamond hair combs are much subtler and more adaptable than those statement pieces. While you could wear them all together for a seriously sparkly effect, you could also choose to deploy a single comb for less glittering coifs. These three Art Deco diamond hair combs date to 1910 are the work of American jewelery manufacturer Black, Starr & Frost. They’re each adorned by an openwork rectangular plaque featuring three Greek key scrolls and millegrain set with single-cut diamonds. These lead to two curving golden prongs on each comb, which are attached to the rectangular panel by an engraved element at the top of each prong. Here’s a close look at the decorative tops. S.J. Philips doesn’t give any metal for the rectangular panels or engraved elements, but I’m guessing it’s platinum given the era and the materials (although it could also be white gold). You can really see the millegraining (the lines of what look like little dots along the edges of the metalwork) in this photo. It’s a subtle touch, but its effect on the overall texture of the piece is just wonderful. Ditto for the engraved element attaching the gold prongs to the rectangular panel. Neither would be noticeable from further away, but close up both are deliberate and lovely. The photo quality isn’t quite as excellent as I prefer, but it’s good enough for me to really want to play with these. Do you ever rock hair bling of your own? How would you wear these combs? 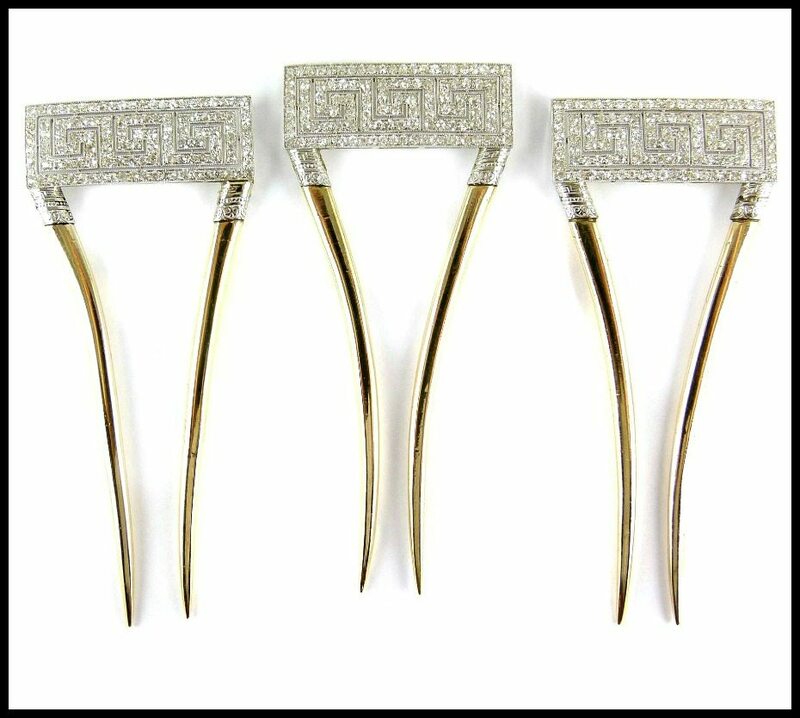 These Art Deco diamond hair combs are currently for sale at S.J. Philips. All images and info are thanks to S.J. Philips.